5 3/4" x 8" x 1"
1" thick Bravo Acrylic Awards. Each piece has a unique 3D fan cut pattern on the sides that flows into a big sweeping arc across the top leaving a large engraving area that can accommodate any of your personalization needs. Engraving is laser etched and a velvet presentation gift drawstring bag is included. Diamond Acrylic award, 3/4" thick acrylic award makes an excellent employee recognition award, achievement award, sales award or customer appreciation gift. Engraving is laser etched and a velvet presentation gift drawstring bag is included. 1" thick Iceberg Acrylic Awards. Each piece has a beautiful 3D cuts around the free flowing outer edge that adds depth and design while leaving a large engraving area that can accommodate any of your personalization needs. Engraving is laser etched and a velvet presentation gift drawstring bag is included. 1" thick Panache Acrylic Awards. Each piece is designed with 3D cuts that create a unique design and shape that enhances a large engraving area that can accommodate any of your personalization needs. Engraving is laser etched and a velvet presentation gift drawstring bag is included. A Clear Elegant Rectangle Paperweight that makes an excellent employee recognition award, achievement award, sales award or customer appreciation gift. Engraving is laser etched and a velvet presentation gift drawstring bag is included. 4" x 3 1/2" x 1"
6" x 5 1/2" x 1"
3/4" thick acrylic paperweight makes an excellent employee recognition award, achievement award, sales award or customer appreciation gift. Engraving is laser etched and a velvet presentation gift drawstring bag is included. 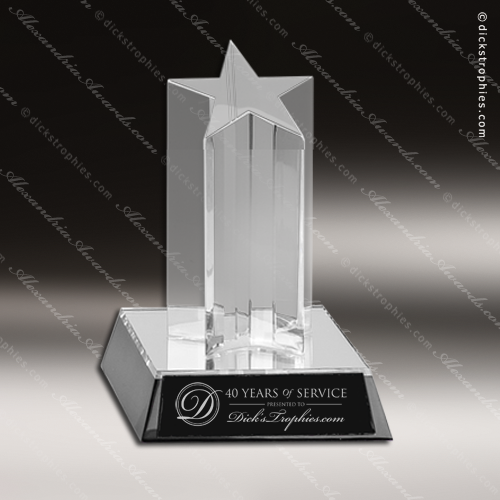 An Elegant Starburst Star Acrylic Award on Clear Base that makes an excellent employee recognition award, achievement award, sales award or customer appreciation gift. Engraving is laser etched and a velvet presentation gift drawstring bag is included. A Beautiful star acrylic paperweight that is 3/4" thick acrylic makes an excellent employee recognition award, achievement award, sales award or customer appreciation gift. Engraving is laser etched and a velvet presentation gift drawstring bag is included. 1" thick Triumph Acrylic Awards. Each piece has a unique cut pattern at the top and sides providing a unique look while leaving a large engraving area that can accommodate any of your personalization needs. Engraving is laser etched and a velvet presentation gift drawstring bag is included. 3/4" thick acrylic award makes an excellent employee recognition award, achievement award, sales award or customer appreciation gift. Engraving is laser etched and a velvet presentation gift drawstring bag is included. Large and impressive acrylic award produced from 3/4" thick cast acrylic makes an excellent employee recognition award, achievement award, sales award or customer appreciation gift. Engraving is laser etched and a velvet presentation gift drawstring bag is included. A Jade Cascade Acrylic Award with matching base that makes an excellent employee recognition award, achievement award, sales award or customer appreciation gift. Engraving is laser etched and a velvet presentation gift drawstring bag is included. Crushed Ice Acrylic award sits on an attached acrylic base and is 3/4" thick acrylic award makes an excellent employee recognition award, achievement award, sales award or customer appreciation gift. Engraving is laser etched and a velvet presentation gift drawstring bag is included. This crushed ice acrylic award sits on an attached acrylic base and is 3/4" thick acrylic award makes an excellent employee recognition award, achievement award, sales award or customer appreciation gift. Engraving is laser etched and a velvet presentation gift drawstring bag is included. Diamond acrylic award 3/4" thick acrylic makes an excellent employee recognition award, achievement award, sales award or customer appreciation gift. Engraving is laser etched and a velvet presentation gift drawstring bag is included. 3/4" thick acrylic diamond award on an acrylic base makes an excellent employee recognition award, achievement award, sales award or customer appreciation gift. Engraving is laser etched and a velvet presentation gift drawstring bag is included. 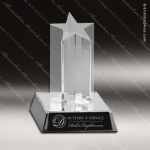 Large and impressive diamond acrylic award produced from 3/4" thick cast acrylic makes an excellent employee recognition award, achievement award, sales award or customer appreciation gift. Engraving is laser etched and a velvet presentation gift drawstring bag is included. 3/4" thick Flame acrylic award makes an excellent employee recognition award, achievement award, sales award or customer appreciation gift. Engraving is laser etched and a velvet presentation gift drawstring bag is included. Flame design 3/4" thick acrylic award makes an excellent employee recognition award, achievement award, sales award or customer appreciation gift. Engraving is laser etched and a velvet presentation gift drawstring bag is included. Large and impressive acrylic award produced from 3/4" thick cast acrylic sits on attached acrylic base that makes an excellent employee recognition award, achievement award, sales award or customer appreciation gift. Engraving is laser etched and a velvet presentation gift drawstring bag is included. Large and impressive acrylic award produced from 3/4" thick cast acrylic that makes an excellent employee recognition award, achievement award, sales award or customer appreciation gift. Engraving is laser etched and a velvet presentation gift drawstring bag is included. A Jade Beveled Rectangle Elegant Acrylic Paperweight that makes an excellent employee recognition award, achievement award, sales award or customer appreciation gift. Engraving is laser etched and a velvet presentation gift drawstring bag is included.